The people of Grace Capital Church have been giving to clean water projects since 2007 when their youth gave to a water project after hearing of the need during a youth camp. The women of the church followed shortly after that, donating from a women's conference. This heart of generosity has continue through today as the campuses in Pembroke and Laconia continue to give by allocating a portion of their offerings from the Capital Campaign are given to clean water projects. 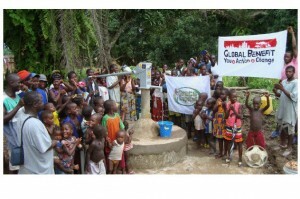 In July of 2011, the organization that Grace Capital was working with, Global Benefit, merged its clean water projects with the work of The Water Project. While the goal and progress listed on this page reflect only a small portion of the total giving-to-date, Grace Capital's people have given, in combination with the amount shown on this page, $160,374.54 toward clean water (thru April 2015 donations).